The Swedish Karate Federation has been selected by the European Karate Federation, EKF, to host the Senior European Championships in 2021. The tournament will be held in the arena Scandinavium in Gothenburg, the second largest city in Sweden, 12th – 16th of May 2021. – We are very proud that we have received the trust of the EKF to host the 2021 championships. Then it will have been 38 years since a tournament of this size has taken place in Sweden and also then the European Championships were held in Gothenburg. The city of Gothenburg has a lot to offer and is situated on the beautiful west coast of Sweden. We look forward to arrange a really nice event and the opportunity it will bring to promote karate, both in Sweden and internationally, says Mr Urban Andersson, President of the Swedish Karate Federation. A positive thing is also that Gothenburg will celebrate 400 years, and we will be able to take part in the festivities with different activities. Since Sweden is not as yet one of the common countries to host international karate championships, Urban Andersson continues, we also look forward to present us as not only competent organizers, but in the whole as a country with good core values, such as democracy, sustainability and equality, which we hopefully will be able to share. 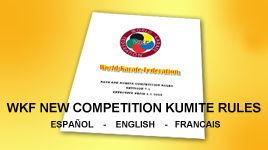 The championship contains the two main disciplines of Kumite (fighting) and Kata (form and technique) as well as Kata categories in Para-karate, i.e. for athletes with disabilities. Para-Karate is kata for wheelchair athletes, visually impaired athletes and athletes with mental disabilities. About 1500 competitors, officials and more are expected to join the event, from the 53 member countries of the EKF. An international congress will also take place during the event week. The Swedish Karate Federation will arrange the championships in collaboration with Gothenburg & Co and Got Event. We are very proud to host a karate championship at such a high level in Gothenburg. Karate is a lifelong practice and it’s fantastic that it includes women, men and para. We are also pleased that the organizer will arrange activities on town outside the arena, which makes it more open to the public, says Magnus Hallberg, Director City of Events at Gothenburg & Co and Got Event. Together with the EKF the work of finalizing the details and proceedings leading up to 2021 will now start.